Partnership presidents — current, Jody Hurwitz Caplan, left, and founding, Ellen Goldner — celebrate at the Birthday Bash. 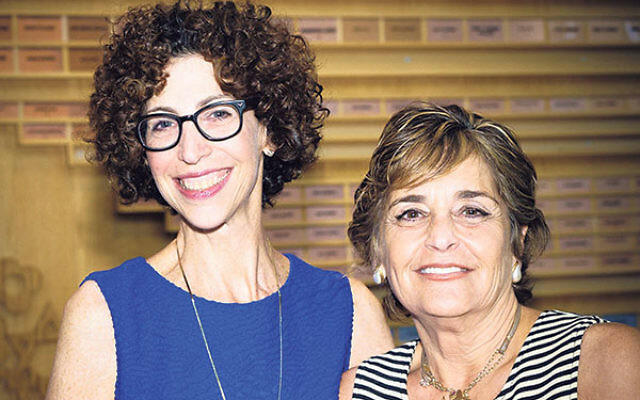 Nearly 200 members of the Greater MetroWest Jewish community celebrated the 10th birthday of The Partnership for Jewish Learning and Life on May 31 and honored two prime movers in its success, Gary and Susan Aidekman. 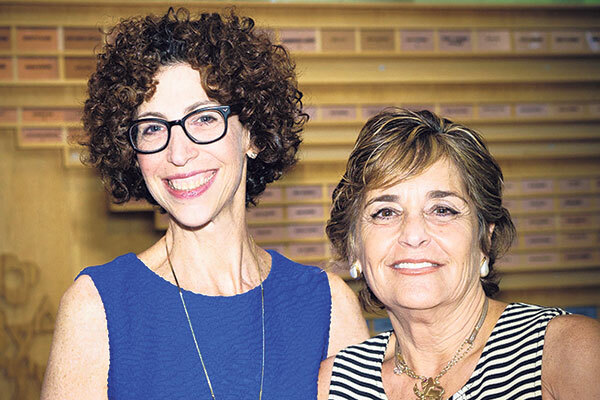 In 2006, the Partnership became a streamlined reinvention of the 49-year-old Jewish Education Association of MetroWest. Testifying to the success of the new agency, four young people who have been actively involved in Partnership programs took turns explaining how those programs have benefited them and many others throughout the community. Jennifer Emdur of Randolph spoke of the enrichment her son and daughter receive as two of the several thousand children in the community, from infants to six-year-olds, who participate in the PJ Library program. Through the program, administered by the Partnership, they receive free Jewish-themed books every month to encourage their families to pursue Jewish learning. The actual name of the “gladiator” is Michael Strom, and he is the Partnership’s coordinator of Jewish service learning. Among those programs are J-SERVE, a Day for Jewish Teens Serving the World; the Justice League, about working toward an equitable society; the Iris Teen Tzedakah Program, which develops young philanthropists; and Mitzvot of MetroWest, a fair that offers bar and bat mitzva projects. “Judah Maccabee” reflected on his time at the Partnership: “For the first time I understood what it was like to be one diverse and yet unified Jewish community — each one of us responsible for all of us…. Sarvenaz Singh, who now lives in Montclair, was born in Iran two years before its 1979 Islamic Revolution and was raised there seemingly as a practicing Muslim. But in her grandmother’s basement, out of sight of their neighbors, her family furtively conducted Jewish rituals, afraid to reveal the secret of their Jewish faith. “It was not safe practicing Judaism” in post-revolutionary Iran, she said, where religions other than Islam were officially banned. As Dana Aidekman introduced the honorees, her mother and father, she said she and her two sisters grew up in Madison, a town without a substantial Jewish population. As a result, “my parents had to find ways of squeezing in Jewish culture whenever possible by building Jewish connections and helping us find meanings…. They were always motivated to find a way.” That determination triggered her father to become involved in founding the Partnership. Nine years later, along with funds from the Jewish Community Foundation of Greater MetroWest NJ and a matching grant from the Foundation for Jewish Camp, the Partnership Summer Camp Enterprise has distributed nearly $2 million in grants to first-time sleepaway campers.